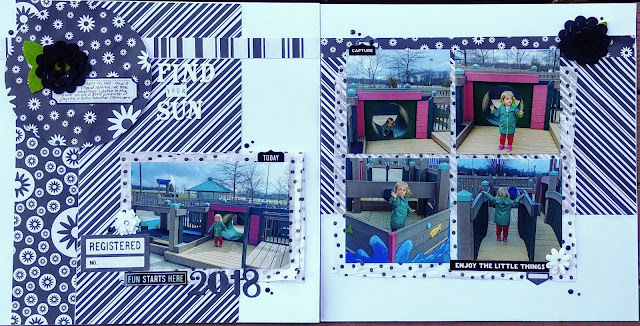 The second challenge is the December Double-Page Sketch Challenge from Stick It Down. 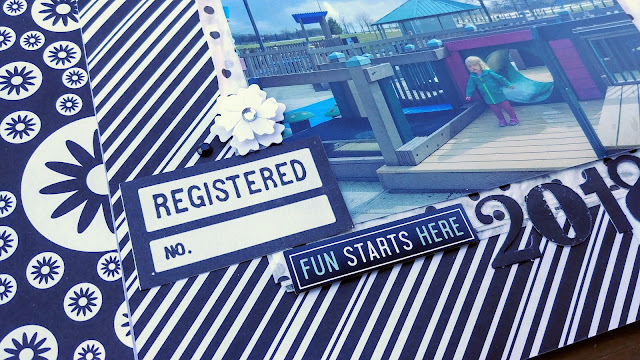 Even though it's freezing here, I know that spring will come again and we'll be hitting up our local park and playground. These pictures were taken at the playground on a day when it had been raining really hard in the morning, and I told my daughter that if the rain had stopped when she woke up from her nap, we'd go to the playground. Well, wouldn't you know it? The rain stopped. We managed to get enough playtime in before the rain started again! I pulled a lot of product from my stash for this one. The papers are from an old paper pad, and I've got some Vicki Boutin Mixed Media stickers on there, plus some random flowers from my stash. 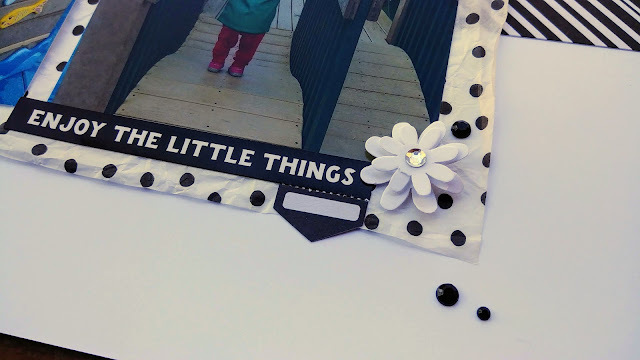 As I've done with some of my other stashbuster layouts, I just picked embellishments without regard to whether or not they really "fit" with the theme of the pictures. If they fit with the scheme of the kit or the challenge, then I was going to use them just to finally use them!! Great use of the sketch. Thanks for joining us at Stick it Down. Great interpretation of the sketch! Thanks for joining us over at Stick It Down. Amazing job with the sketch and love the colors you used as well! Thanks for playing along with us at Stick It Down. Fantastic layout! Love the monochromatic colour scheme! Thanks for joining us at Stick It Down! Gorgeous layout. Thanks so much for playing along with us at Stick It Down. Beautiful page! I love the monochromatic look! Thanks for joining us at Stick it Down! What a great way to use our sketch! Very fun. Thanks for joining us at Stick It Down! Not only is it National Craft Month, but it's also Women's History Month! 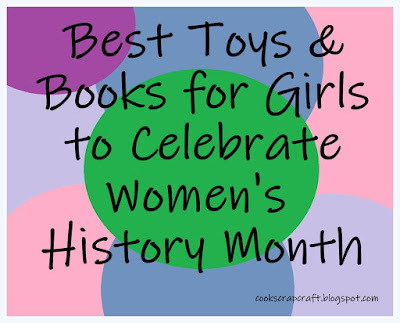 I love discovering toys and books that are perfect for giving young girls a glimpse into the powerful women of the past and the powerful future they can create for themselves. Here are just a few new finds available this year for your girls! As a Spice Girls-singing teen, these "girl power" pencils, erasers, and more would have definitely been in my bookbag! This compilation of essays, edited by Lilly J. Goren, has been on my to-read list for a long time. 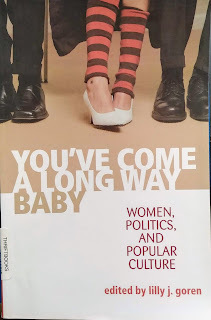 I was excited to read it because, judging from the title, I thought it was going to be a look at the way things were compared with the way things are now, more of a history of women's rights as opposed to stand-along essays that look at different topics in the world of women's studies. I must admit that I didn't enjoy the book when I first started. I sort of got the feeling that there were things I needed to know before reading this book, but I missed out on taking the pre-requisite course. Seriously. The very first chapter compares the crucifixion of Jesus Christ with women's willingness to undergo extreme plastic surgery. The second chapter is all about chick flicks. Before I had a kid, I always assumed that parents could instinctively understand what their toddlers and preschoolers were saying. I could never understand the words coming out of other people's kids' mouths, but I was reassured watching the parents respond. You all were just smiling and nodding, thinking, "I have no idea what you just said, kid." My own daughter started talking at 18 months and it escalated fast. Her first word, aside from "dada", was "doggie", but it always sounded more like "da-hee". Still, when she's saying it and pointing to a dog, you kind of know. Other words, not so much. Her: "We go dassee pop." Me: What did I just agree to?